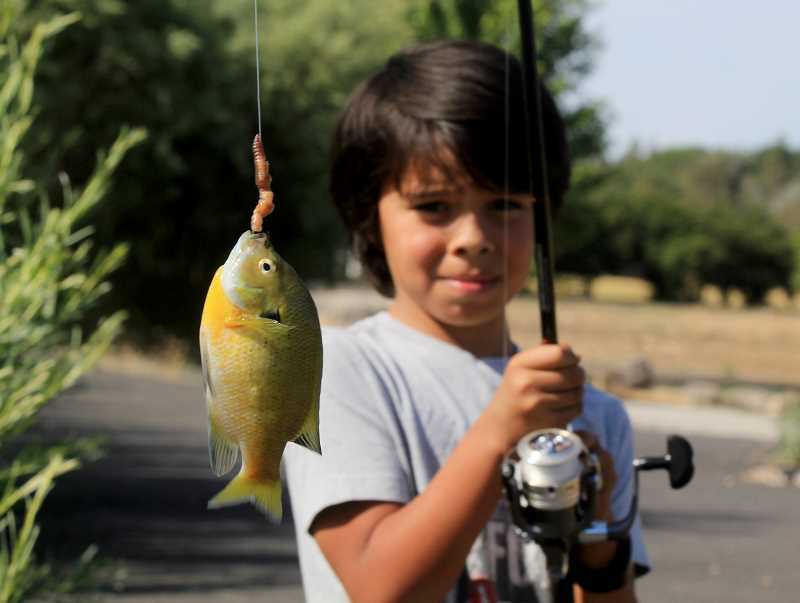 Kids Club member has quite an experience at youth pond, on his first time on a fishing trip. The Kids Club of Jefferson County took members to the Jefferson County Youth Fishing Pond for a field trip June 13, for what would become an amazing fishing adventure. 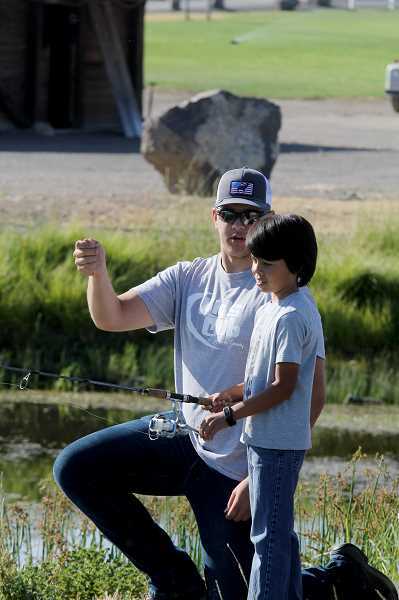 Kids Club employee Garrett Webb took the kids to the pond, teaching them basic fishing skills, with tips and tricks, showing an incredible amount of patience with the kids. Webb showed them how to cast, where to place the line, and how to reel it in. He also had to deal with getting hooks out of trees, and broken lines and bobbers — the frustration that goes along with learning how to fish. "A lot of kids spend time inside on their phones, so I wanted a way to get them outside and introduce them to fishing," said Webb. "Fishing teaches these kids patience; if anyone knows me they know that patience is not something I am good at. With fishing, you sit and wait, learning the traits of being patient. I use fishing for a quiet, peaceful time to relax. Even if you don't catch anything, it's still nice to enjoy the view and the silence." "Hopefully, I can teach the kids how to catch fish and not Pokemon," Webb said referring to the fact that the youths spend more time on their phone and playing games than being outside. Kids Club member Bradley Wahneta, 8, who has never been fishing, was about to have quite the fishing adventure. Bradley has been eagerly awaiting the fishing trip for a long time. Webb handed him the fishing pole and taught the young fisherman how to cast a line. Bradley, with a huge smile on his face, held the pull tight, flipped back the reel and cast for the very first time. The hook soared through the air, for what seem like forever, and stuck into the only tree in the entire pond. Bradley's smile diminished a bit, but he was still determined to catch his first fish. The group fished for about an hour with no luck. They moved back and forth to different sides and spots of the pond. Several fish were biting and getting everyone's hopes up, before swimming away free. One of the members finally found a hot spot and reeled in the first fish of the day. Everyone was excited to see someone was able to catch a fish and the club wasn't sent home emptyhanded. Bradley was happy for his fellow club member, but you could tell he wanted to catch a fish himself. After the first fish was caught, Bradley seemed a little sad. He described fishing as "weird" and "pretty fun." With a disappointed look, Bradley said he hadn't caught anything yet. Bradley also said fishing was something he might try again, and he learned lots of helpful tips, like being patient. Seconds after talking to the young fisherman, his bobber started going up and down in the water, and soon all the way in the water. He had his first fish on and was reeling and pulling as fast as he could. Webb was next to him, teaching him to slow down and take his time. Bradley pulled the fish out of the water and smiled from ear to ear, finally able to catch his very first fish. Although he was able to catch a small crappy fish, he didn't really want to touch it or get near it. Less than a minute after he caught his first fish he was able to catch another fish. That time, he was willing to touch and hold the fish, and released it back into the water. "I was really nervous; my heart was beating really, really fast," Bradley said. "It was super cool to catch something. I wasn't sure I was going to. I would definitely do this again." Bradley, who was very excited and happy to be on the trip, turned to Webb and immediately asked when the next fishing trip would be. The only sad face Bradley made after catching a couple fish was when he saw the Kids Club van pull into the parking lot, ready to pick the kids up. He asked all the Kids Club staff if they could stay out on the pond longer and keep fishing. Everyone agreed to stay longer, so young Bradley could fish even more. Thanks to the amazing organization that is Kids Club of Jefferson County and employee Garrett Webb, Bradley will now have a memory of the first time he caught a fish. 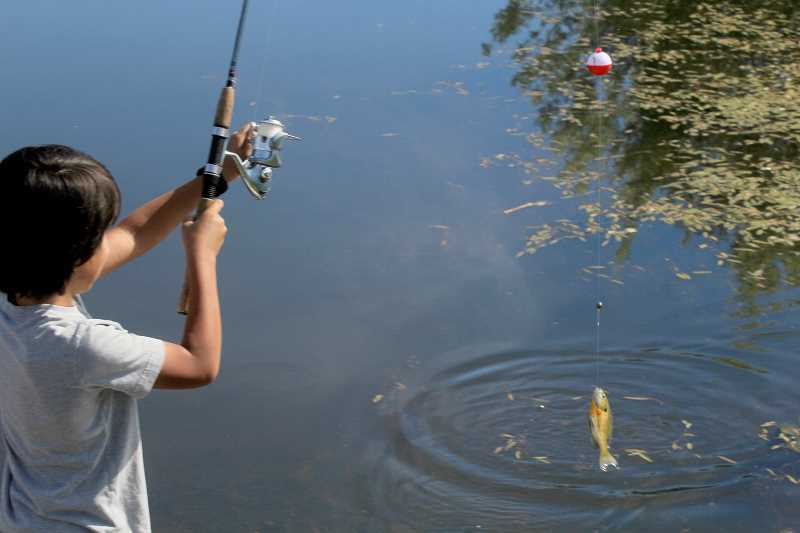 From never holding a fishing pole, getting a hook stuck in a tree, to reeling in a fish, it will be something he will be able to share and remember as his first fishing adventure. "That is what Kids Club is all about," said Operations Manager Caren Pilkington. "We try and create opportunities for these kids they wouldn't normally get at home: make sure they have fun, while teaching them skills for the future."